A message from a friend alerted me to a westbound load of LKW Walter trailers. These trains run as extras and catching them is not very easy unless, as was the case today, there is some advance warning. This was all the motivation I needed to leave the house and enjoy the beautiful late-summer sunshine for an hour. With the number of red class 66s increasing all the time (there were three on hand today) it was nice to catch one of the gray units. 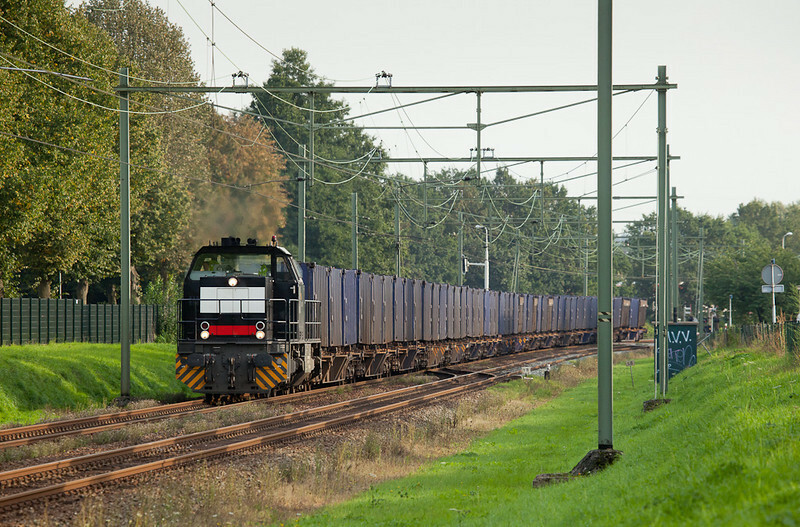 DLC DE 6606 brings a LKW Walter intermodal train past Montzen's old Block 16. It's been exactly 5 months since the last post and about as long since I last took a train picture. A number of reasons conspired, most of them unpleasant, but such is life. I believe there should be more frequent updates again now. 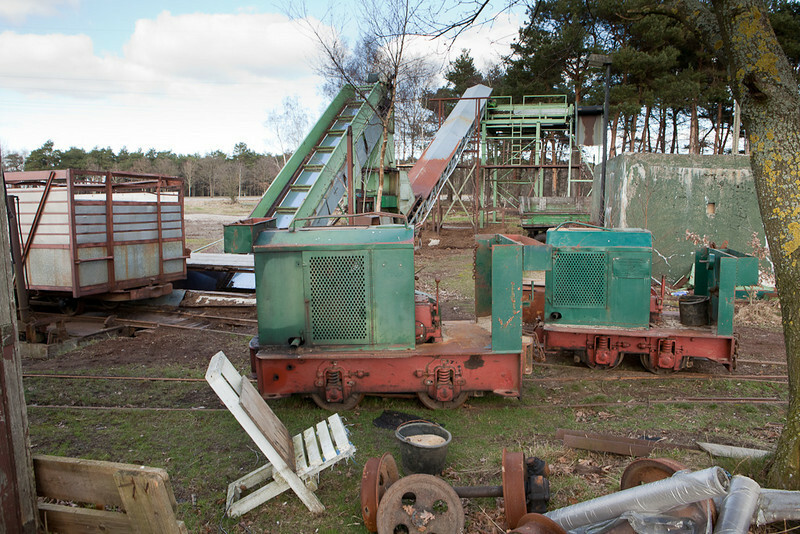 For starters I will have a good crop of trolley pictures up soon, watch this blog for a teaser and a link. Returning to the subject matter at hand, I had noticed that one of Crossrail's JT42CWR-Ms (the ones with 5 body doors and cab a/c units) had received the new red paint job when it passed the house yesterday. The same unit was back today with the eastbound P&O train so I set out after it to capture the westbound which is invariably hauled back by the same engine. Here then is squeaky clean DE6314 "Hanna" dropping downgrade from Trois Bornes Tunnel towards Montzen and ultimately Muizen. Crossrail DE6314 leads the P&O train 40170 (Brindisi/I - Muizen-Goederen) at the Rue d'Aix in Moresnet. A recent business trip took me to the Croatian capital of Zagreb. I was able to make use of a bit of free time to snap some trolleys on the city's network. Many more shots are now available in the Trolley gallery. Tatra T4YU 433 leads B4YU 820 on line 8 as it turns into Janka Draskovica. Today a pilgrims' special was booked, headed for the famous town of Lourdes in France. After a grey day the sun popped out and bathed eastern Belgium in sweet light. Being a Saturday the railfans were out in droves. Anyway, here's the train after being delayed 45 minutes in Aachen Hbf. What should have been a nice sunny place turned into a shadow hole, under the moaning of the 8 other people present here. But since you need to work with what you got I tried a somewhat different angle with the forest and the farm. The viewer be the judge - compare with the shot from 2-May-2011. 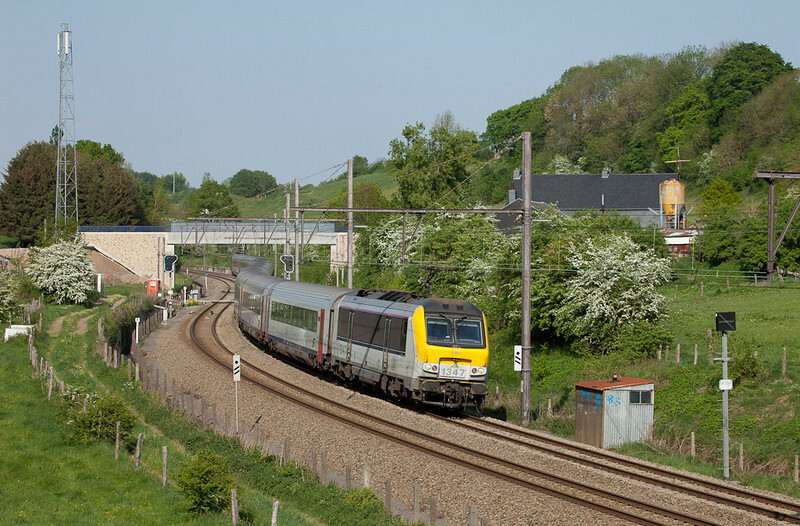 2727+2734 with pilgrims' train 18501 (Emmerich/D - Lourdes/F) passes the Chemin de Ruyff. 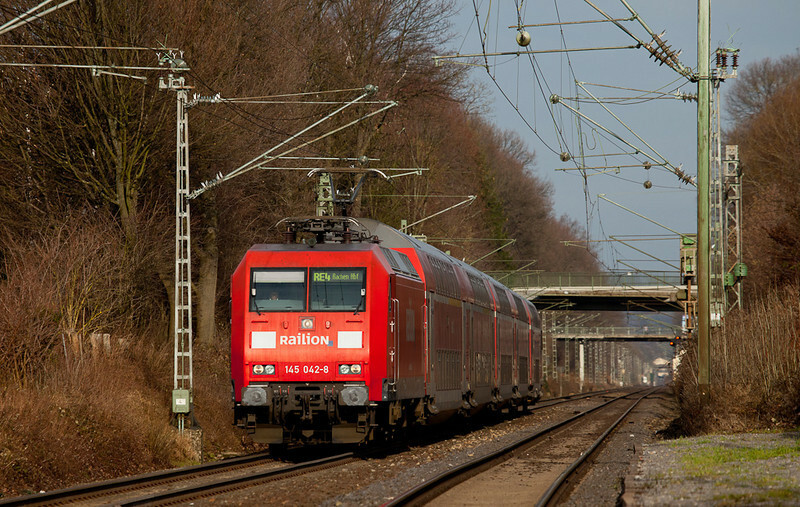 A DB Schenker class 186 Traxx was conducting a few trial runs between Aachen-West and Montzen this morning. 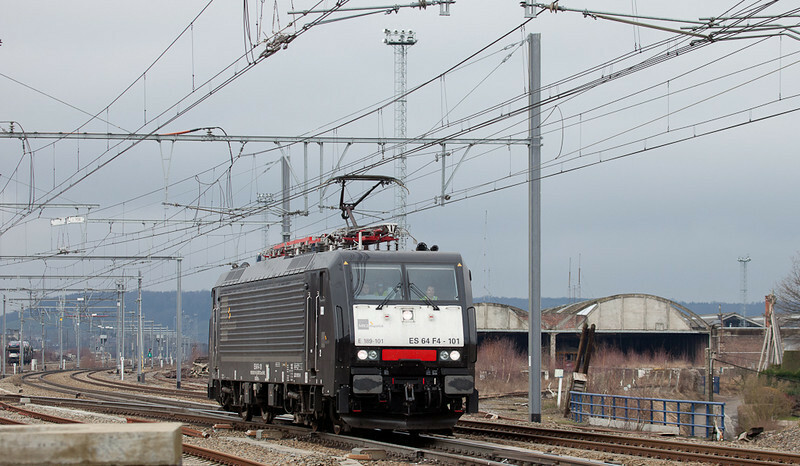 The purpose is unknown though a reasonable assumption would be that DBS is interested in running trains through from Germany into Belgium outside of the Gremberg-Antwerp/Liege corridor that is covered by the Cobra alliance with B-Cargo. Whether that is true and whether anything tangible will come from it within the foreseeable future is unknown at this point. But again - some variety to ease the green-gray Traxx monotony would be more than welcome. Here, then, is the unit on its first lap to Montzen. 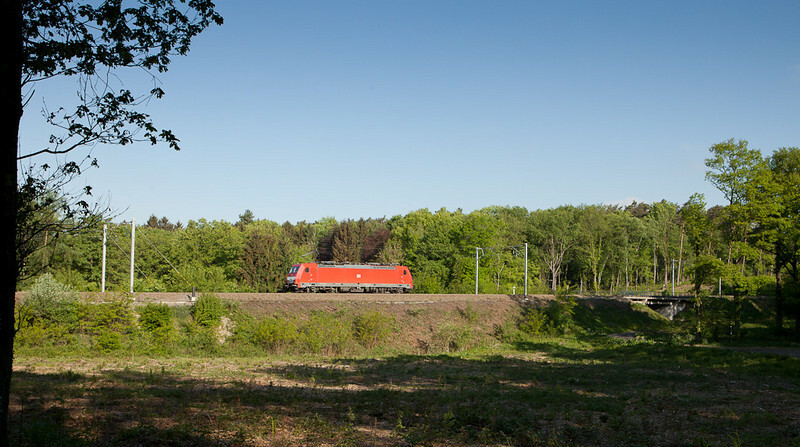 Unless someone was foaming to the east of me this is quite possibly the first ever shot of a DB Schenker 186 moving under its own power in Belgium. DB Schenker E 186 324 crossing over the Rue d'Aix in Moresnet. 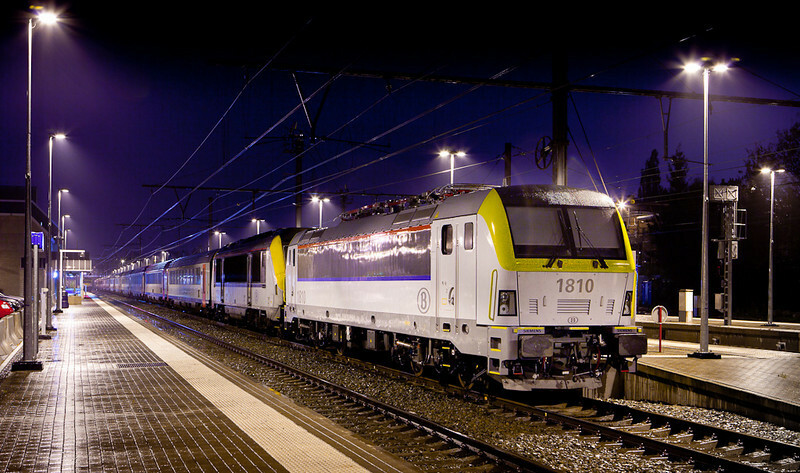 Delays with the approval of the new class 18 have so far kept SNCB's class 13 on the IC-A and IC-O Intercity trains. A number of driver familiarization trips over the past weeks indicate that this is about to change so something had to be done to capture 13s in the service they have held down for as long as I can remember. The gorgeous weather we have enjoyed for several weeks now called for an outing to the upper Vesdre valley where the hawthorn is still in flower. 1347 with an IC-A between Welkenraedt and Dolhain. Today a special train was booked to pass by close to work so a somewhat prolonged lunch break - with proper timekeeping of course - was on order. Here's an example of the class 103, once the star of German high speed intercity rail travel. Several of these six-axle engines have been kept around for museum duties and the odd special assignment like this one. Their unmistakeable 1970s styling with the classic beige-red colors elevates them to something like honorary steam engine status among fans. 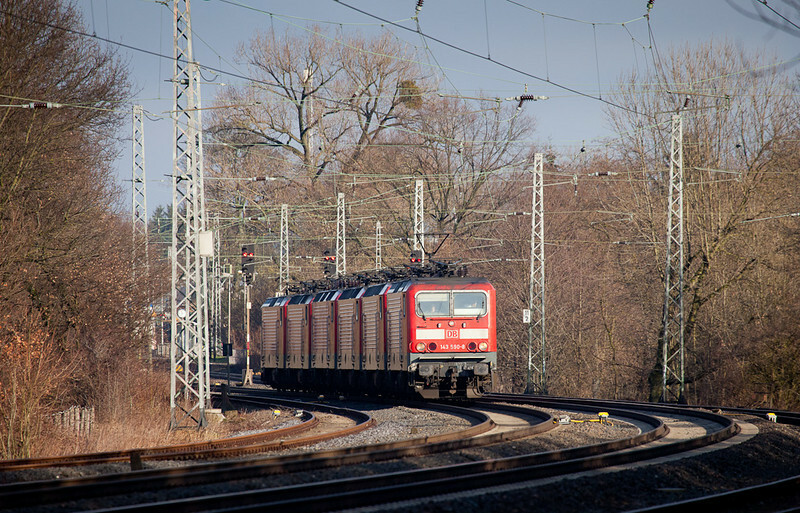 103 222 with measurement train 91676 south of Kohlscheid. Another road trip north gave the opportunity for a few more pictures of peat works. The very active Carl Hornung works in Quickborn north of Hamburg was delightful to visit, while further south the Zubrägel company has unfortunately ceased to use their ancient equipment. Two new galleries have been added to the Peat Works section of this site. 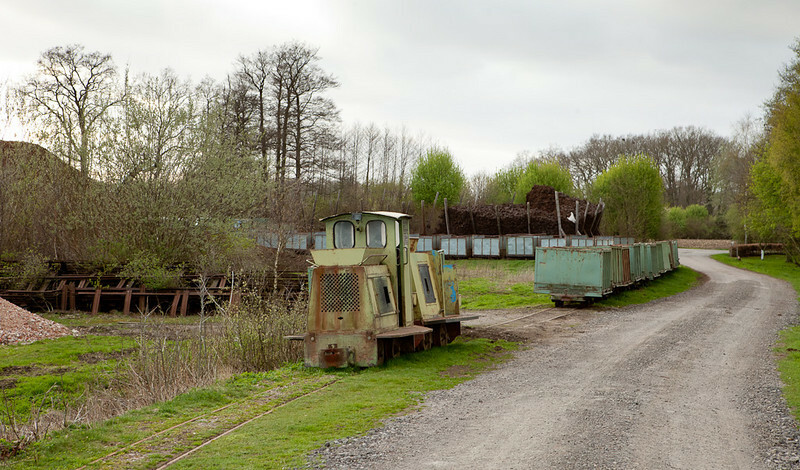 Two Schoema engines and a string of racks at "Torfwerk Zubrägel - Vechta". A recent road trip brought with it the possibility of a couple of strategically-timed breaks to look at peat railways in northern Germany. There is still an amazing variety of these little-known roads harvesting peat, mostly for sale for use in gardening. In years past it would also have been used for domestic heating and cooking. Two Diema engines at "Torfwerke Ahrens KG - Verladestelle Hatzte". Returning from a particularly unsuccessful night photography session I decided to take a quick spin by the gas station in Montzen, and as luck would have it the black Trainsport Class 66 was present. So out came the tripod for a couple quick snaps. I really like the way the strong tower floodlights create a shadowbox effect, a bit like shooting a model railroad scene against a black craft paper backdrop. This view is the opposite of the 22-Feb-2011 entry, showing the generator, fuel pump, and associated apparatus. Trainsport/Rurtalbahn 266 115 at the gas station in Montzen. 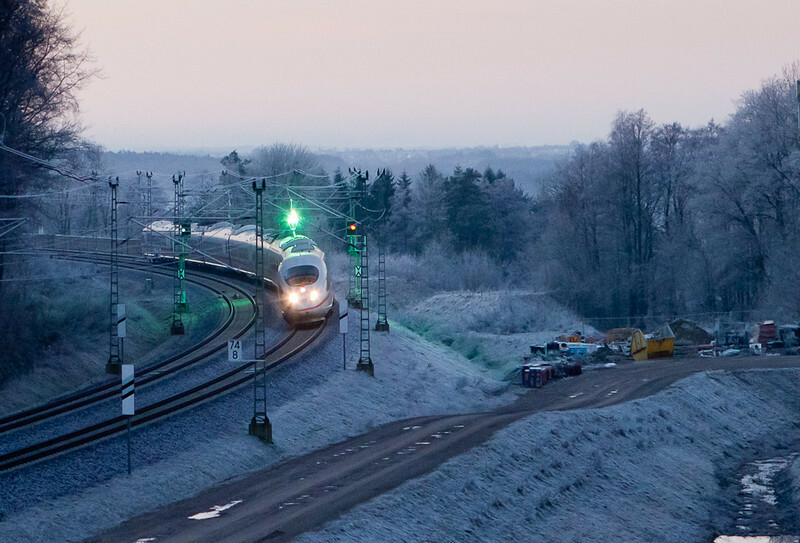 Siemens and Belgorail were conducting tests with a Siemens class 189 on the L24 this Friday. The unit came over from Brussels under its own power, ran back and forth between Montzen and Aachen West twice, and eventually retired to Liege at the end of the day. Here she is seen leaving Montzen on the first run down to Aachen. That's the old disused customs shed in the background. The trial created quite a stir in the local railfan community, much to the amusement of the test crew in both cabs. By way of explanation, everybody is fed up with the endless procession of class 28s and is hoping for some variety. 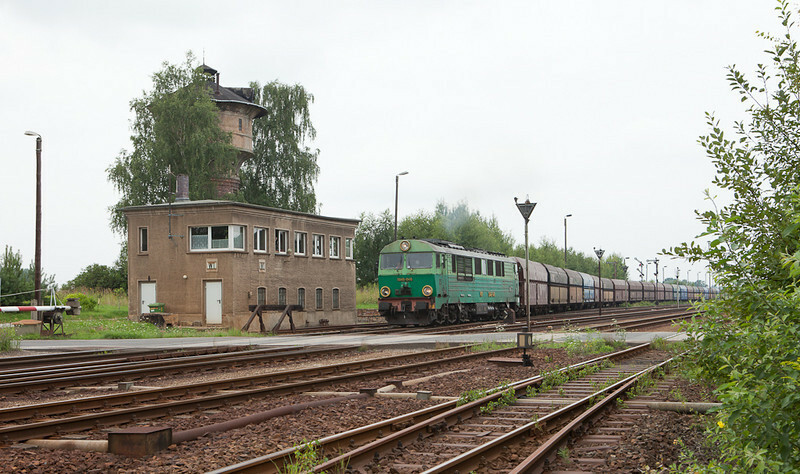 ES 64 F4-101 passing B16 in Montzen. RailService Net - owners of the gas station in Montzen - have been adding some hardware to the new fuel pad version 3. A very yellow tank, a generator, a fuel pump, and a bunch of camera and safety equipment were installed to convert the place to a self-serve drive-in. The plan is for engineers to top their rides up themselves starting next week, without requiring a RSN employee to be on site. Crossrail's very clean DE 6606 stopped by tonight. 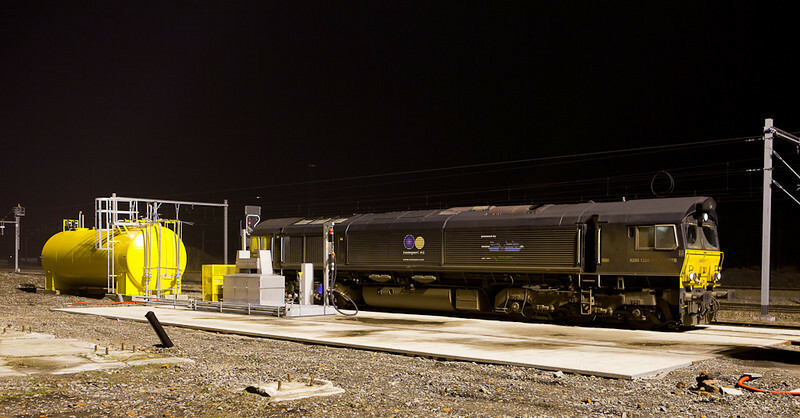 Crossrail DE 6606 filling up in Montzen. 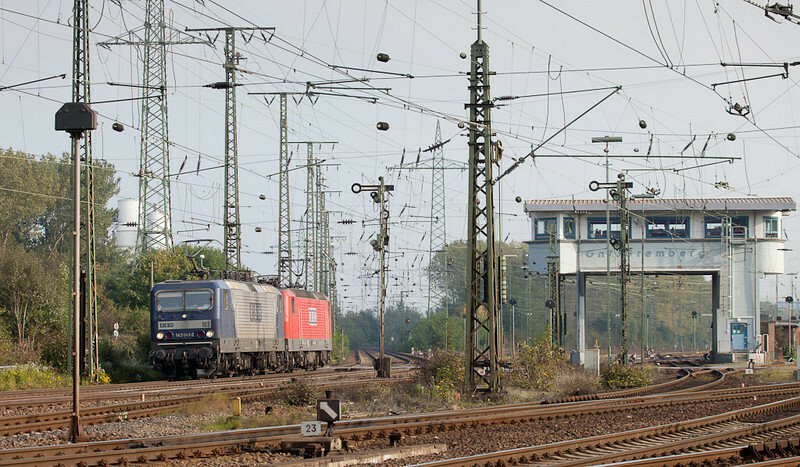 A special move was booked for today that would take surplus ex-East German class 143 engines to a scrap yard in Stolberg. Sun and a break cooperated so a quick walk down to the high iron netted a picture of the convoy running about 20 minutes late. 143 590 with 143s for Stolberg in Kohlscheid. A Railservice Net employee was on hand at Montzen tonight to fill 'em up. After a Crossrail class 66 had cleared the pad this Trainsport/Rurtalbahn G2000 moved in for a drink and a chat. 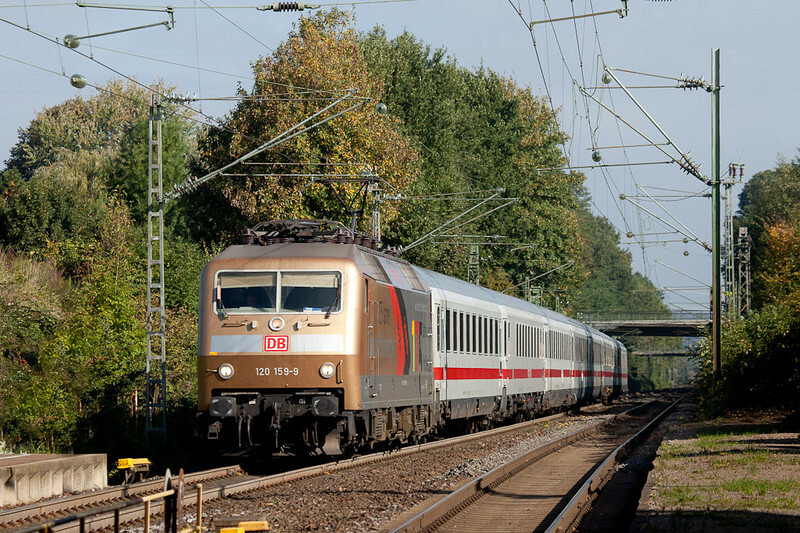 DB Regio, the commuter branch of Deutsche Bahn, is enduring a bit of a power crunch at the moment. A number of the class 111s that usually power the RE4-line trains have been moving on to other duties. 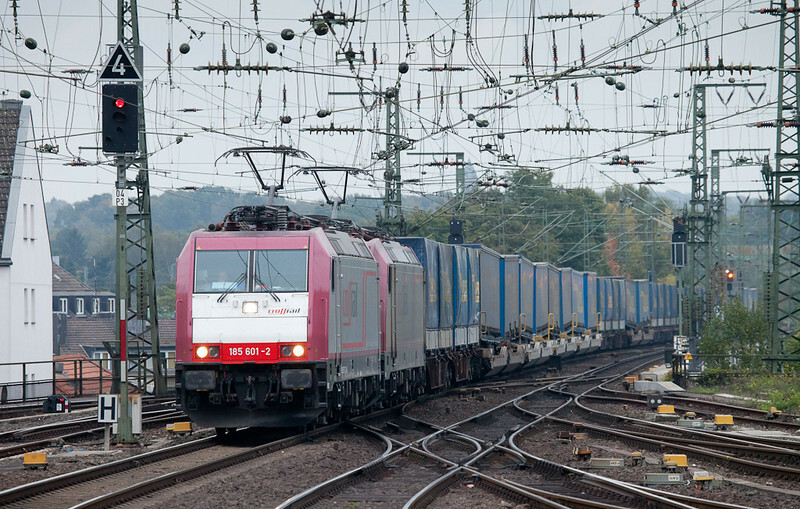 To pinch hit, half a dozen class 145s have been leased from DB Schenker (ex-Railion exx-DB Cargo, etc...). Seeing a Railion-branded engine hustling a train of doubledeck coaches along is mildly unusual so a quick lunchtime outing in the springlike weather was in order. 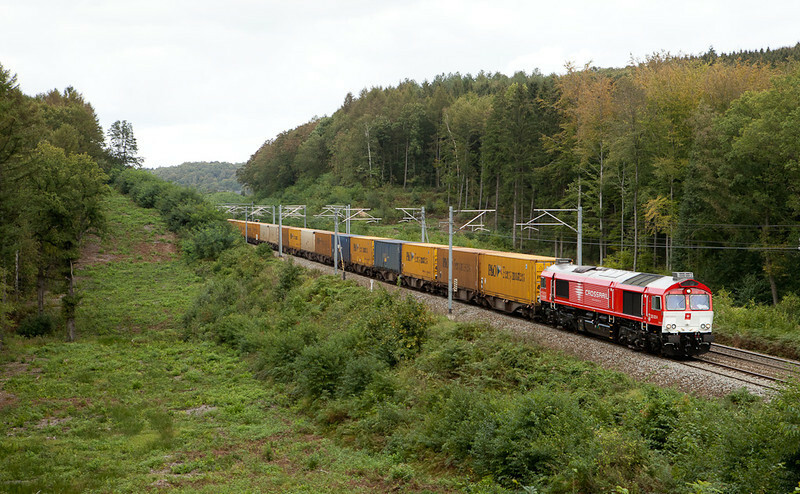 Here's one of the units rushing upgrade from Herzogenrath to Kohlscheid. 145 042 with RE4 10416 Dortmund-Aachen Hbf in Kohlscheid. The 10th was a busy day on the railroad, despite being a monday. 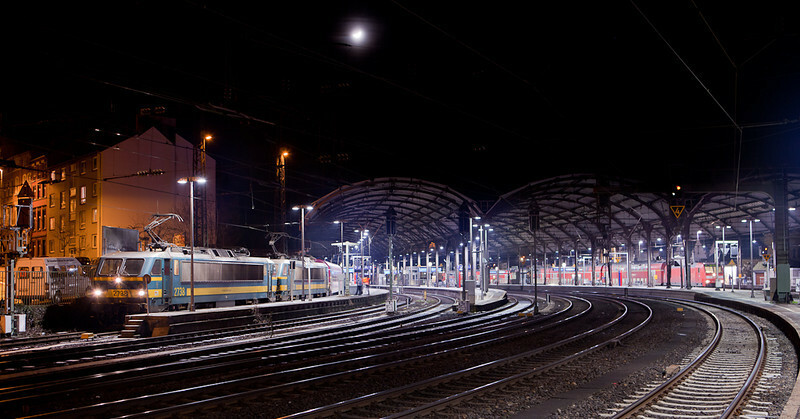 My third trackside outing of the day took me to Aachen main station at night, when a special train carrying skiers to Switzerland arrived to change power for the onward journey through Germany. In this view the two class 27s have pulled the 14 car train forward as far as possible in an effort to get the rear end off the switches at the west end of the station. A brace of class 218 diesels took over later as can be seen in this movie. 2738+2720 with ski train in Aachen Hbf. 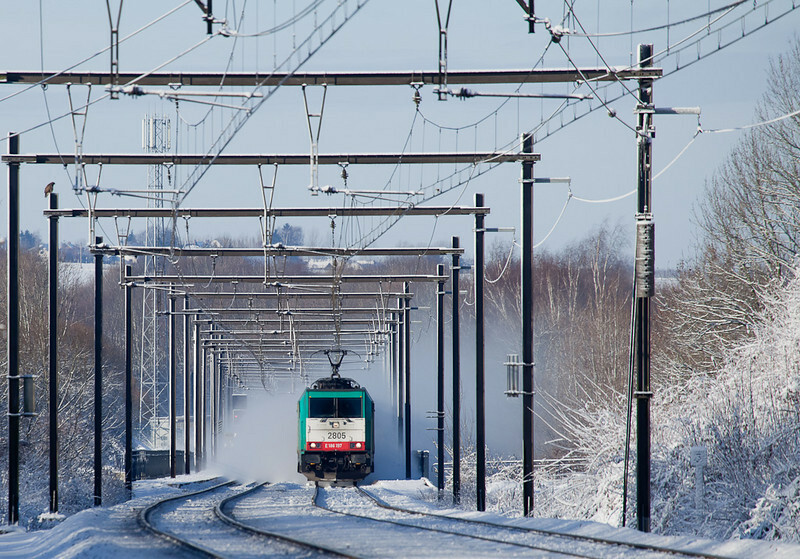 The morning of January 10th dawned with a heavy frost that had encrusted the catenary with a layer of ice. Another form of ICE (the train) had a few issues with that. Namely the electronics that are designed to keep the train from radiating disruptive frequencies into the lineside signaling systems kept cutting the main switch every time the engineer was trying to accelerate. Thus I was witness to about 30 minutes of fantastic arcing, bone-chilling crackles, and a decidedly not-high-speed train trying to reach the Busch Tunnel with ice-free catenary inside. Here's a video of one of those attempts. ICE11 at the Busch Tunnel. The weather report predicted the 20th to be the last day of nice snow before the end of the cold snap and rain setting in. So an effort had to be made to capture the good stuff while it was still there. An afternoon of frosty yet satisfying shooting ended as the sun set on the shortest day of the year. The hill in the background separates Germany from Belgium. 1200 years ago Karl the Great set up camp there on the night before arriving in the Roman village that was later to become the center of his empire - Aachen. The temperature reached a record (for this winter so far) -15C 3 hours later. Happy winter solstice, wherever you are! Class 146 pushes a RE1 towards Aachen Hbf in Rothe Erde. Another 4 inches of snow overnight and a beautiful sunny Saturday morning - almost like an early Christmas present. A falcon looks on as 2805 kicks up a snowstorm racing her mixed freight through the Remersdaal interlocking towards the Gulp Tunnel. 2805 racing east across the Remersdaal viaduct. There's been snow on the ground for over three weeks now, more or less. Currently more again, after a nice snowstorm blanketed the area yesterday and created the normal havoc on the roads. 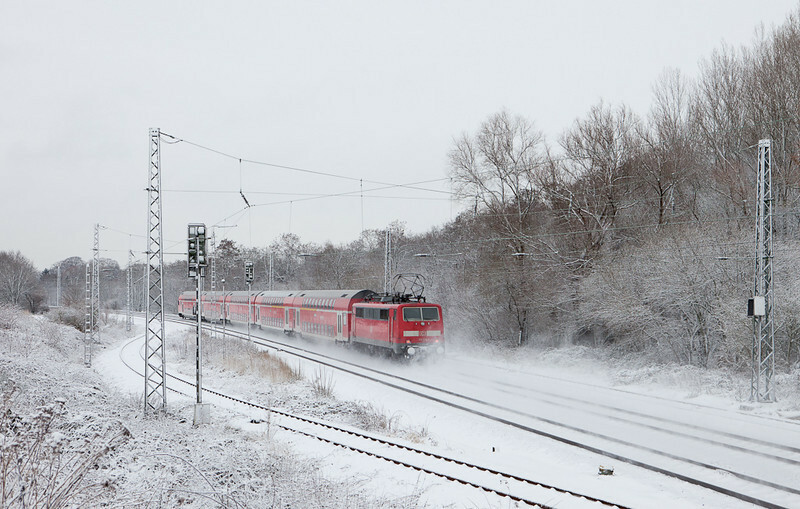 Train service survived relatively unscathed as exemplified by this class 111 shoving her rake of doubledeck commuter cars through a wintery scene. The wet snow doesn't blow around very much, but it does cling to the trees and masts nicely. 111 125 pushes the RE4 northbound towards Dortmund through Bank. It was time for another trip to Stockholm, Sweden last week. Sweden in December is cold, dark, and - well, very Swedish. I braved the cold for a couple of hours, and pictures from the trip have been added to the Scandinavia galleries. 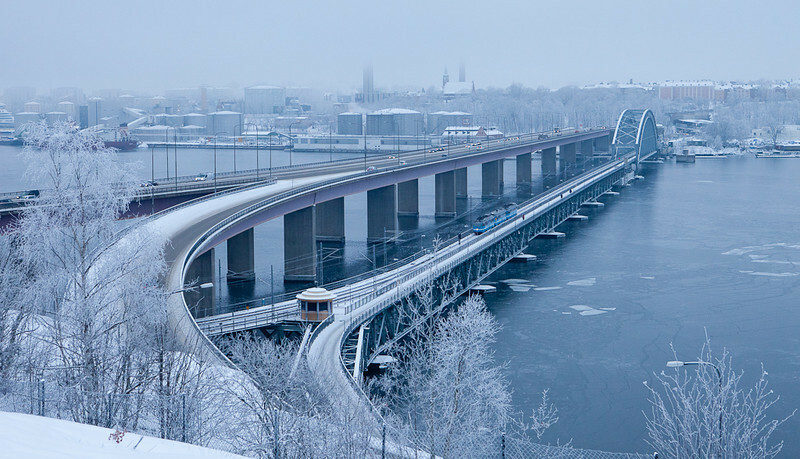 In this gloomy mid-day view a train of the Lidingöbanan interurban crosses the impressive bridge to the island as it starts its journey towards Gåshaga brygga. Lidingöbanan crossing the Lidingöbron towards Torsvik. A moonscape remains of what days ago was a thick patch of fir trees. The harvesters have left behind a cover of shredded branches and bark. For the next year or so a new angle has been opened up. Even though the steel furnace at Ougree is down for a few weeks following an explosion, steel product continues to flow from the area until the stock of coils at Liege is exhausted. 2805 has a trainload of it in tow as it passes the scene of destruction. 2805 with steel train passes eastbound over the Rue d'Aix in Moresnet. Cologne is a hotbed of rail activity with many unique locations. 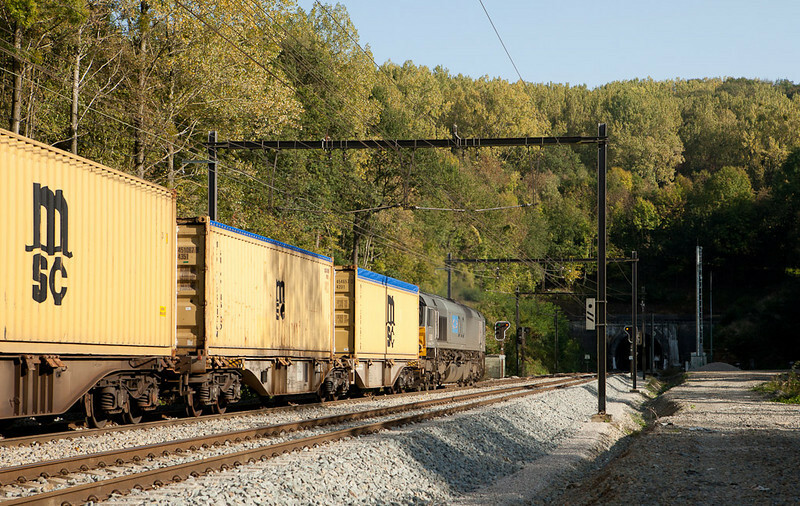 Arguably one of the busiest and most accessible is the north throat of Gremberg freight yard. I had a couple of hours to kill before I needed to be at the airport and decided to stop over at Gremberg as it's on the way and less than 10 minutes by car from CGN. One of the moves I caught was this pair of ex-East German class 143s that now earn their bread as part of Rheinbraun's fleet. Unusual Gnf is one of several active towers in the area. 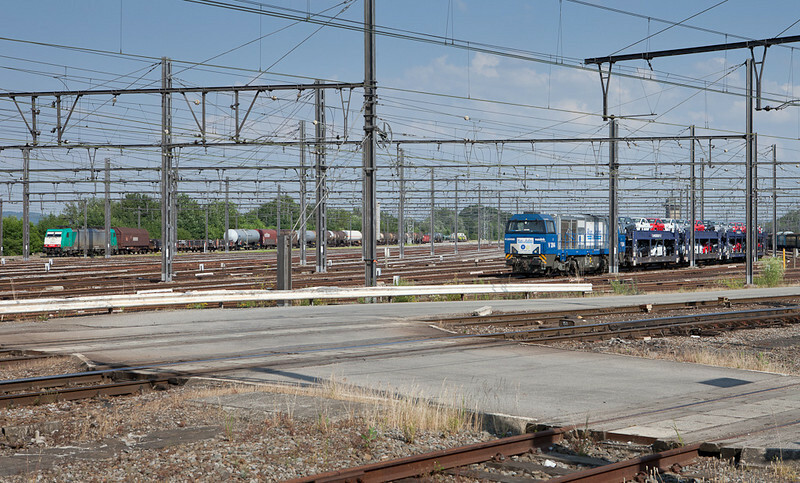 It operates a good number of semaphores controlling the yard exit and intersection of three freight main lines in the area. RBH 103 (143 041) and RBH 109 (143 936) pass Gnf tower in Gremberg-Nord. 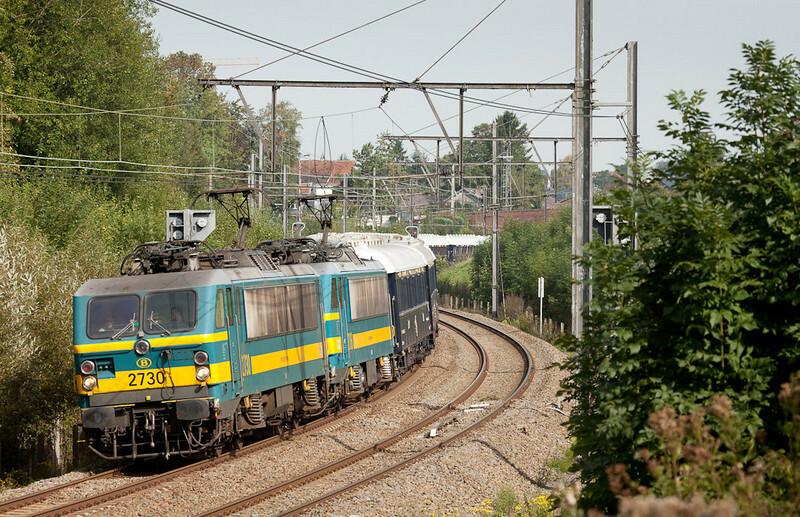 Siemens and SNCB have a somewhat checkered history when it comes to the technicalities of getting the former's products certified to run on the latter's network. The designated successor to Alstom's class 13, the new class 18, is no different. Undergoing tests for over 18 months now there still seem to be open issues preventing the machines from entering service. 1810 is running tests again between Liege and Brussels this weekend. 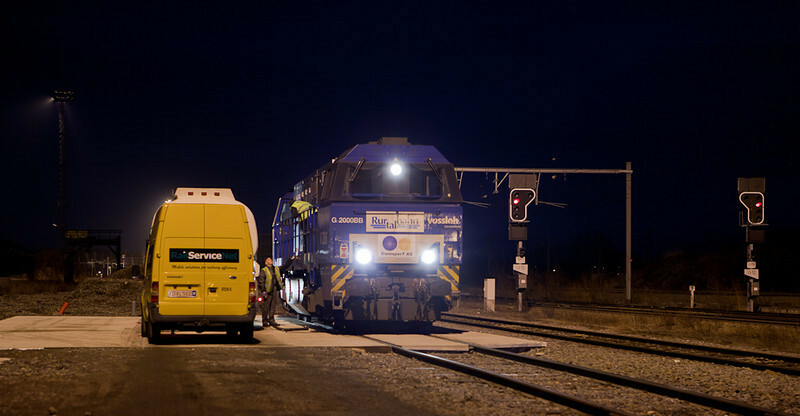 Here the unit is parked with protection power 1337 and their train in Welkenraedt to await Sunday's activities in 5 degrees, a good northwesterly wind, and driving rain. 1810 and 1337 parked for the night in Welkenraedt. 14-Oct-2010 I spent a short hour hanging around on the platform at Aachen Hbf after work today. Basically just on the odd chance of a freight or two coming west. And indeed that was some fortunate timing, even if the light wasn't cooperating at all. This is a train that I have been wanting to catch for a good while. I have no idea about the schedule or number, just that it is a good-sized unit train booked by "LKW Walter", a freight forwarder. It is loaded with trailers and swap bodies. Today it had a rather uncommon doubleheader of Crossrail's attractive class 185 electrics for power. Beacon Rail 185 601 + 185 600 (on lease to Crossrail) approach Aachen Hbf with a unit train of "LKW Walter" swap bodies and trailers. 12-Oct-2010 Fall is setting in in a big way. We had the second consecutive night with subzero temps. The Maas valley was enshrouded in thick fog this morning, resulting from the relatively warm river water hitting the frigid air. I was waiting for the Chatelet/F steel train to show up with the customary class 23 doubleheader, only to be thwarted (again!) by the French striking. If they continue at this rate they might just shut down public transport altogether for want of customers willing to endure the "service". 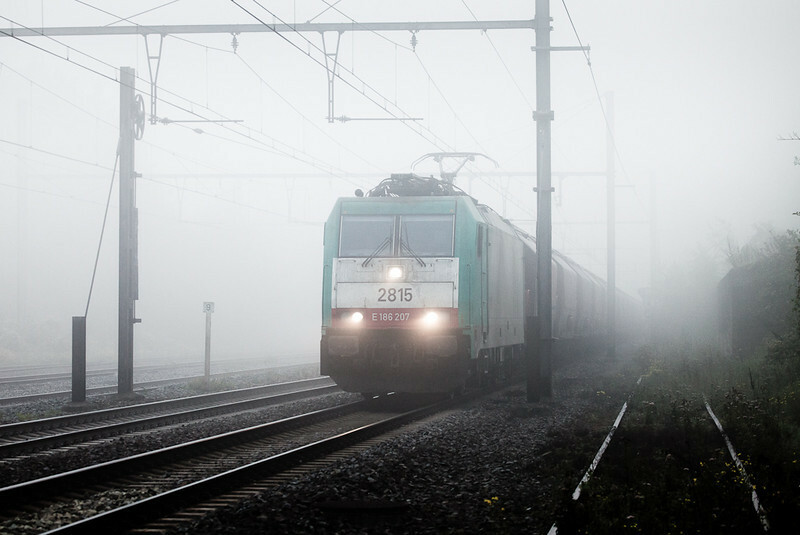 2815 with covered hopper train piercing the fog in Vise-Haut. 9-Oct-2010 A free Saturday with superb weather and late summer temperatures. What better to do than enjoy the great outdoors, camera in hand. This going-away shot was taken at the west portal of the Gulp Tunnel, just west of Montzen. It's interesting in several ways. First, the ABS signal displays orange+green horizontal, which means "approach next signal expecting speed restriction". That signal is the eastbound Hindel home signal, which will display a diverging medium indication to bring the train into the yard where the engine will likely refuel. Second, the open-top MSC containers effectively dwarf the engine, illustrating how much larger the continental European clearance plate is compared to the British. Third, recent construction has changed this area quite a bit. New ballast and track, a redone access road, new GSM-R antennae, and nicely cleared brush are apparent. A number of new angles have thus been opened up. Fourth, PB20 is one of only a handful of engines still wearing DLC decals. DLC PB20 leads an MSC container train into the Gulp Tunnel west portal. 8-Oct-2010 This Friday one of DB's special-liveried engines was booked for the IC 1918 (Aachen - Berlin). The rack is on the south end which means it pushes the train all the way; not very useful for photography. 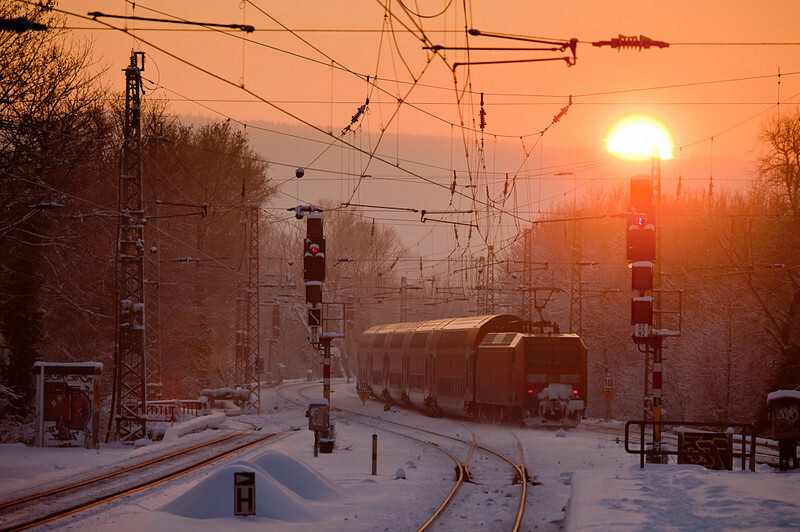 However, the train arrives as an empty stock move about half an hour before departure, with the engine leading into the sun. 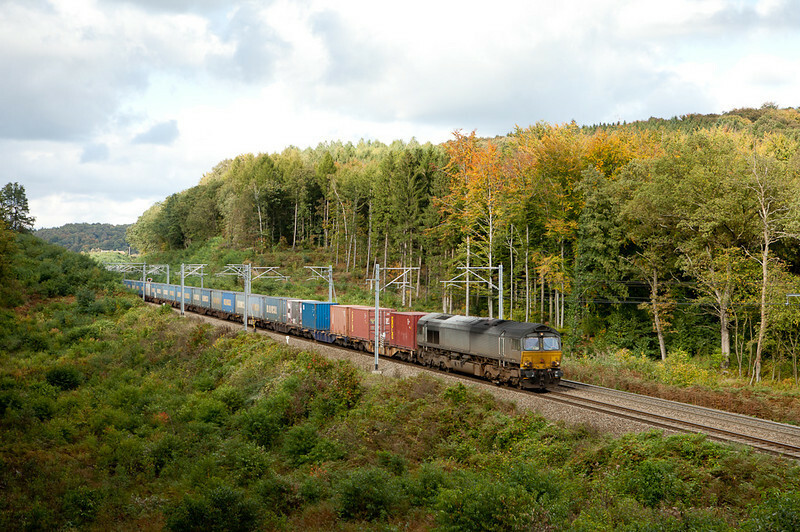 Here 120 159, wearing silver and gold commemorating 175 years of railroads in Germany, passes some fall color 10 minutes north of Aachen. Hm. I remember the 150 year festivities and the stickers they pasted onto engines back then - must be getting old... 120 159 on empty stock move Lr 78532 (Dortmund Bbf - Aachen Hbf) for the IC 1918 heads southbound through Kohlscheid. 5-Oct-2010 The nice weather beckoned me to leave the office early and head out to the forest to check the fall colors. Of course it clouded up merely seconds before this plain-vanilla 66 came up from Aachen with the loaded Bulkhaul train. Every now and then there are some other boxes added to the consist as is the case on the first three platforms here. An unidentified DLC 66 with the westbound Bulkhaul train passes the Rue d'Aix in Moresnet. Piece by piece and bit by bit, DLC is fading away. Even though they were the majority partner in the merge with Crossrail, it is the latter's identity that is set to survive. 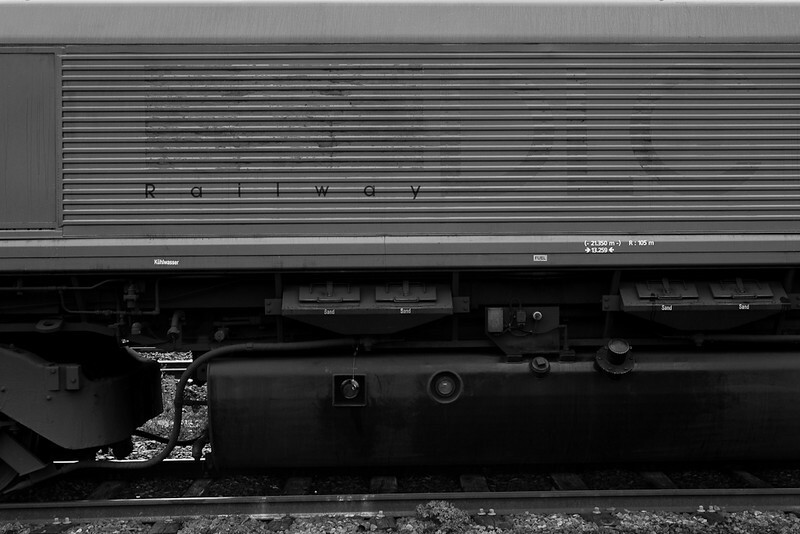 Only through the vagaries of the locomotive leasing business, with units changing hands and being swapped between owners on almost a monthly basis, does the old logo survive. Such as this specimen, still to be found on the flanks of PB19. The unit was returned to the lessor at the end of 2009, only to find itself back running for DLC in 2010.< p /> DLC PB19 in Montzen. 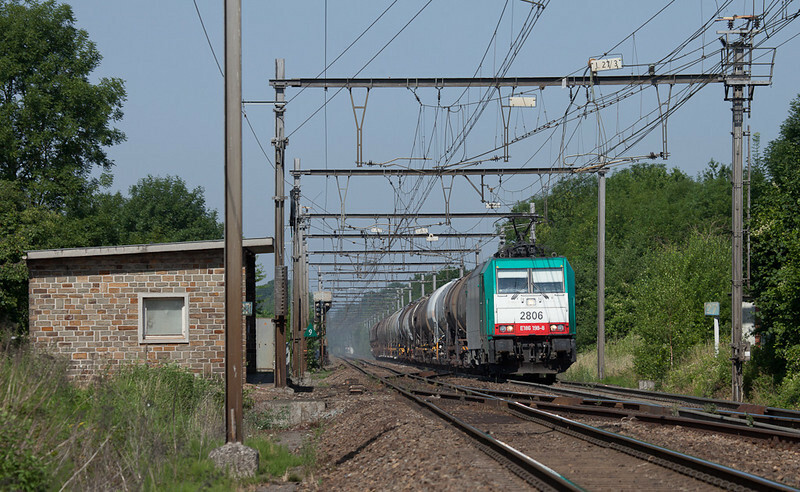 The French were striking again this Thursday, seriously curtailing rail service in the country as well as affecting international trains originating or terminating in France. One victim was the Venice-Simplon Orient Express that was detoured via Aachen and terminated in Oostende. This is easily the longest and heaviest passenger train to have run here in years, totaling 17 cars and almost 1000 tons. Motive power was a class 120 in Germany to Aachen where a doubleheader of class 27s took over for the Belgian leg. The photo shows the stately entourage after it passed through Welkenraedt and starts downgrade into the Vesdre Valley. It was running wrong-hand main to leave a path open for the scheduled IC-A from Eupen to Oostende which followed within 3 minutes. The passengers were treated to nice views of the beautiful scenery from their lunch tables (probably far better than what they would get to see on the regular route). Even the weather was cooperating with what turned out to be the last day of a nice spell of Indian Summer sunshine. 2730 + 2706 lead the detouring Venice-Simplon Orient Express downgrade into the Vesdre Valley. We have enjoyed several days of beautiful warm and sunny fall weather recently. Hanging around at Block 16 until after dark I noticed the moon come up over the Viaduc de Moresnet and was hoping for a westbound train to frame it with. One of the junk freights from Germany had the honor. This picture would have been quite hard to capture on film. In the digital age, you increase ISO, keep in mind to later postprocess with ND filters and noise reduction, and can concentrate on getting the shot. Granted you could have done the same 10 years ago, but who would have even bothered to carry a roll of film that survived a push to ISO 1600? 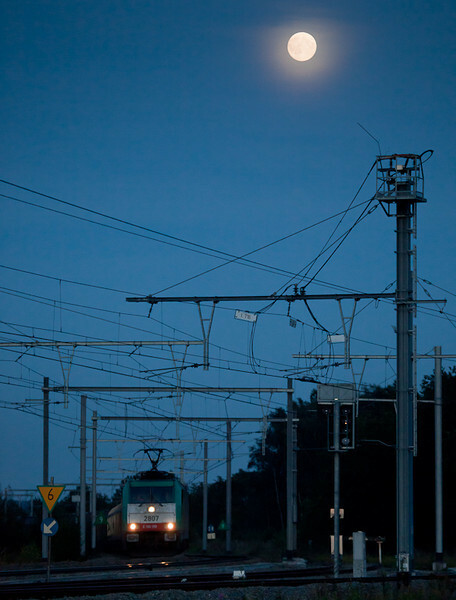 2807 brings the 44538 (Gremberg/D - Antwerpen-Noord) past Block 16 under a full moon. While returning home today I noticed the setting sun casting a nice light on the forest at Remersdaal. I stopped at Obsinnich just to have a look when a headlight pierced the darkness of the Gulp Tunnel in the ridge in the distance. With literally not a second to spare 2826 came racing westbound past the "interlocking shack" and into the last rays of daylight. Nighttime temperatures fell to the low single digits the following night. 2826 leads the empty limestone train 48566 (Oberhausen/D - Hermalle s/Huy) through Remersdaal. Trash train time again! As the days get shorter and the sun sets further to the south every day, the northbound leg of the train gets harder to shoot in decent light. So an outing to Bunde was in order to make use of some nice diffused sun for what could be the last time in 2010. The MaK unit put on a nice show as its engineer was trying to make up lost time. An unidentified ACTS G1206 leads the trash train 50094 (Haanrade - Beatrixhaven - Vam/Wijster) through Bunde. This is a shot that was several years in coming. 7812 is on the point of the "kaolin local" serving CBR's large plant opposite Vise as it tiptoes past the small village of Loën with empty tankcars in tow. This class 77 is remote-control equipped, note engineer on front porch. I previously spent hours perched on this hillside while the train held in Vise yard and wouldn't come out. Typical railfan detector fail... Today everything came together. 7812 leads local 74140 (Bressoux - Vise-CBR) past Loëns. A recent trip to the Nahe wine region in Germany facilitated a short side trip to the Guldental Light Railway Museum. This is a fascinating operation that takes the visitor back to a time before the widespread use of trucks in construction and industry. 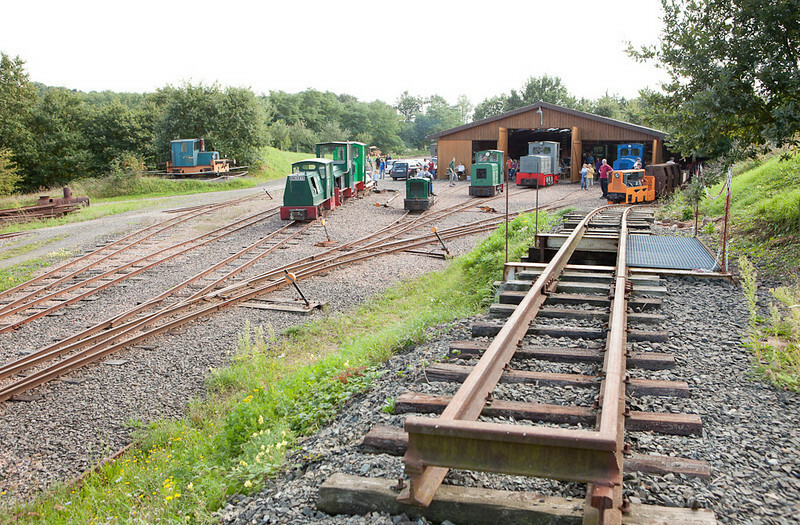 View of the engine house with some of the equipment parked outside. 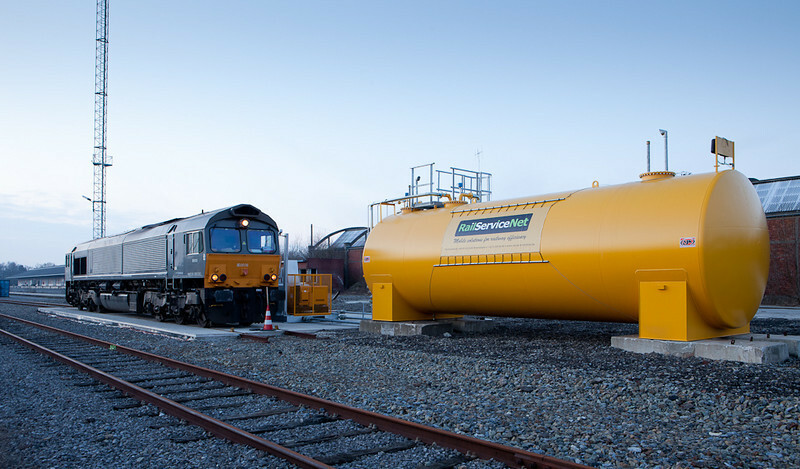 Crossrail has a new gas station in Montzen. Looking splendid in red it sits in the old team track area, which is quite curious as the tracks there were thought to be abandoned after the B16 interlocking was rebuilt in 2008. But they have now gotten a new lease on life. A recent road trip took me to Saxony in eastern Germany close to the border with Poland. The area is a veritable time machine with manual block operation, semaphores, manned crossing gate towers, etc. A set of photos can be found in the new Far-East Germany gallery. These pictures were taken mere hours before the area was devastated by the worst floods in over a century. PKP SU46-046 departs Horka Gbf with an empty coke train for Poland. It's a blistering July Saturday morning in St. Martin-Fourons on the L24. This station is a virtually identical twin to Remersdaal, with equally difficult sight lines. Morning eastbounds are about the best bet, especially with a long lens forcing the perspective - the white trackworkers' hut is almost 2 kms away. 2806 makes like a speeding bullet as it races 44567 past the old block station and through the crossovers. 2806 leads the 44567 (Genk-Goederen - Gremberg/D) through St. Martin-Fourons. Sundays tend to be rather quiet on the railroad around here. Traffic picks up somewhat in the late afternoon, with the first train out of Germany being 2843 leading one of the junk freights from Gremberg past the unusually busy yard at Montzen. 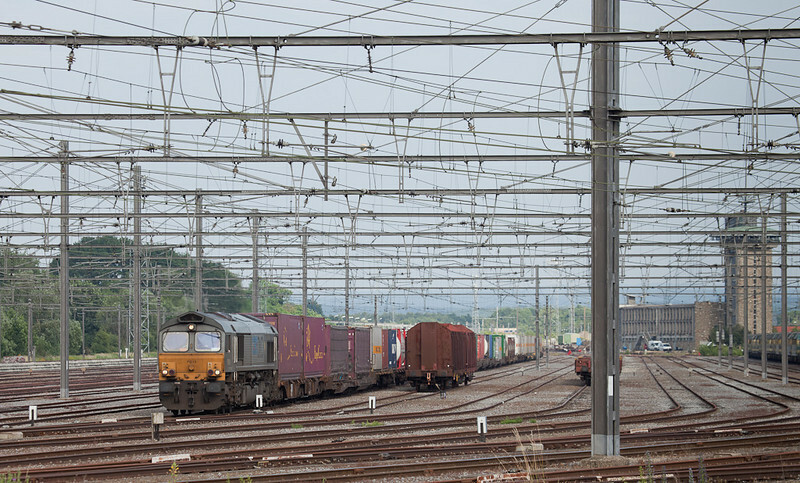 V204 has a trainload of new Corsas on the hook, presumably bound for export through the port of Antwerp. Additionally there was a train of Fords and a string of empty racks in the yard, evidence of an auto trade that is growing by leaps and bounds after a couple of hard years. Happy 4th of July to those that celebrate it! 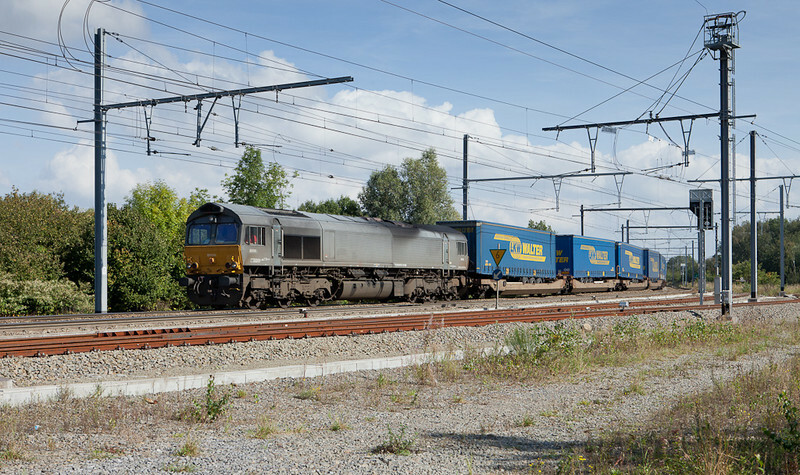 RTB/TSP V204 with a train of Opels for Mosolf Auto Distribution and 2843 with the 44520 (Gremberg/D - Antwerpen-Noord) in Montzen near Block 14. I went on a short after-work outing to the beautiful - if hot! - Meuse Valley on the last day of June. The hoped-for northbound limestone train to Holland was a no-show, but this southbound empty move led by venerable 2339 more than made up for the loss. 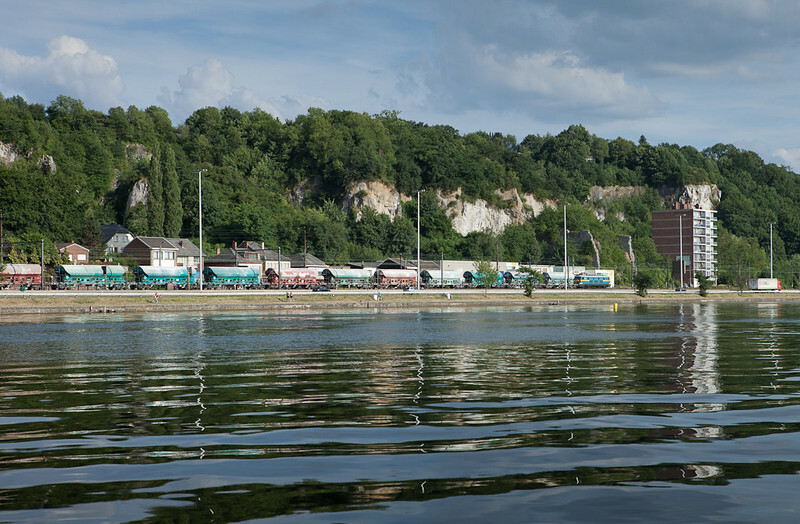 Here the entourage passes through Hermalle s/Argenteau past the bluffs and typical maisons liegeoises as it heads up the river towards the quarries at Hermalle s/Huy. 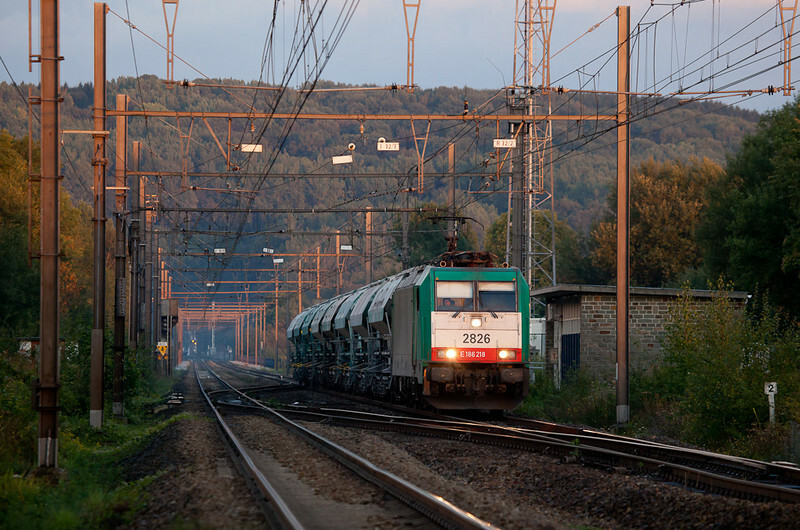 2339 with an empty limestone train near Hermalle s/Argenteau. On a hot and muggy day in late June PB19, still in her full DLC livery, leads the most sizeable intermodal hereabouts through the Montzen yard. Most of the tracks in this view have had their eastern ends truncated near the old hump and are now essentially stubs. DLC PB19 with the 41542 (Ludwigshafen/D - B.Ramskapell) in Montzen in front of B15. I hadn't been to Eschweiler in over 4 months so I figured it was just about time to do that and spent a few nice hours trackside this afternoon. Just laying in the grass and happily webcamming away. 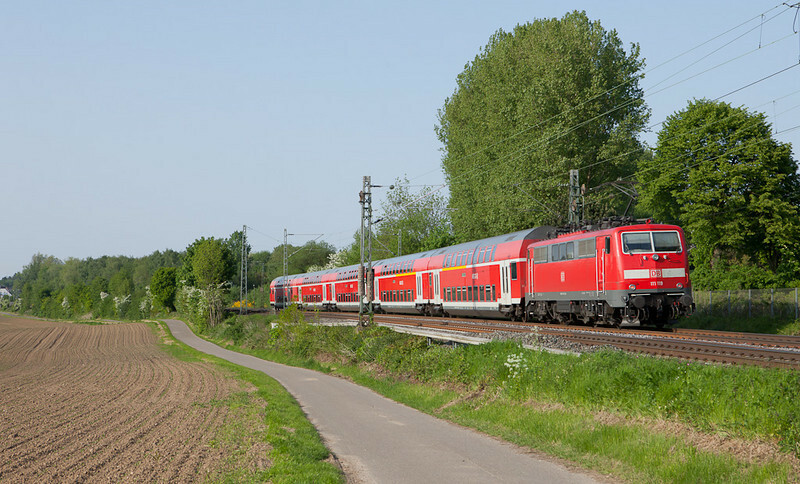 2821 leading 185 229 and the 44538 (Gremberg - Antwerpen-Noord/B) through Eschweiler. Looks like 2010 will be a rather colorful year for us Class 66-fans. 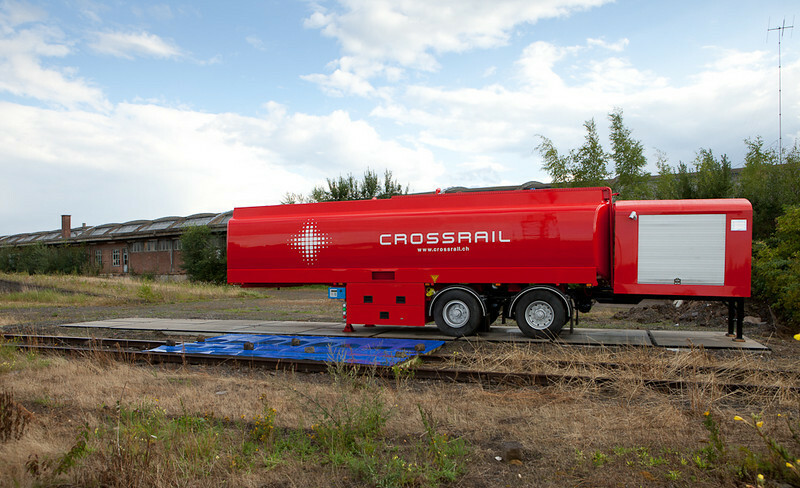 Crossrail has gotten their PB03 painted in a strikingly bold red-and-white scheme. It features their new logo, a symbolized Swiss cross. 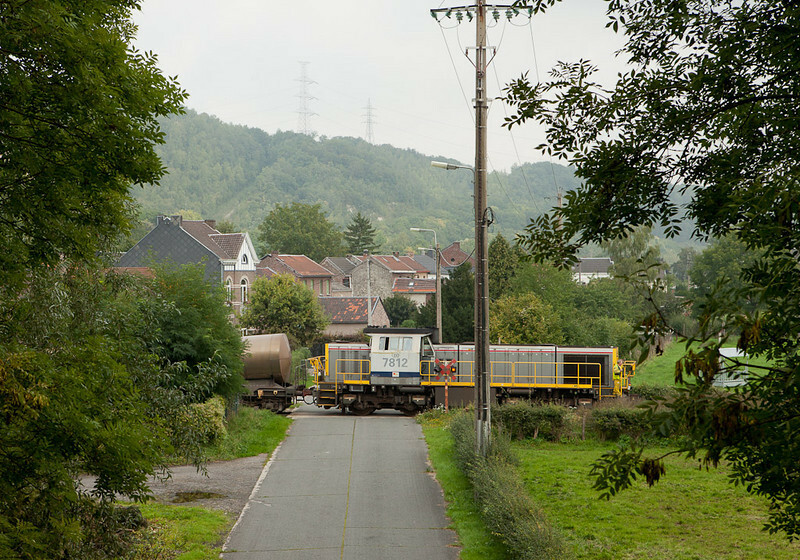 Apart from the Dutch 6400-series "Vlaamse Reuzen" there are no other diesels in Belgium that are painted red. So while our friends across the border in Germany would be yawning at yet another red engine, for Belgian foamers this unit is great news. So - PB01 and PB02 are green, PB03 is red; what's next from the paint shop? Crossrail PB03 "Mireille" hauls the 40180 (Brindisi/I - Muizen-Goederen) past the Rue d'Aix in Moresnet. My semi-annual pilgrimage to Stockholm, Sweden happened to be on Passover Monday, a bank holiday where I live but not up north. So I was able to make use of half a free day, with sun to boot. I sought out a good number of X2000s, my favorite high speed trains. 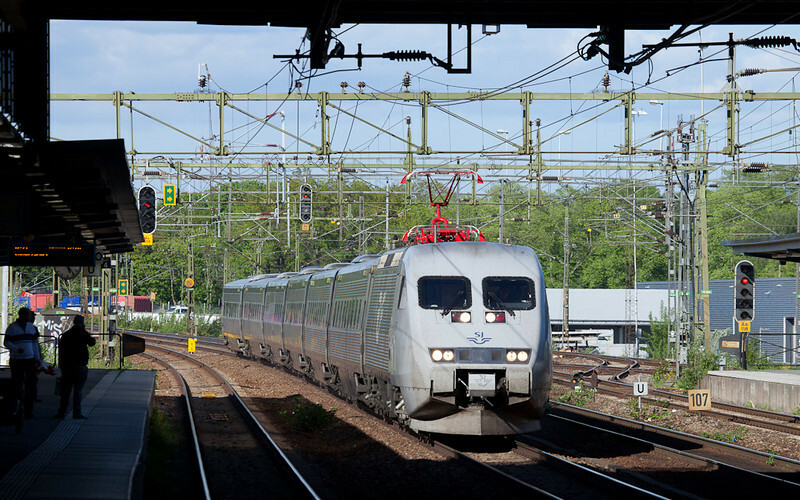 Here's one screaming through the station of Älvsjö, southbound. The remainder of the shots can be found in the newly created Stockholm gallery. Another after-work outing to the 485 netted a few shots. 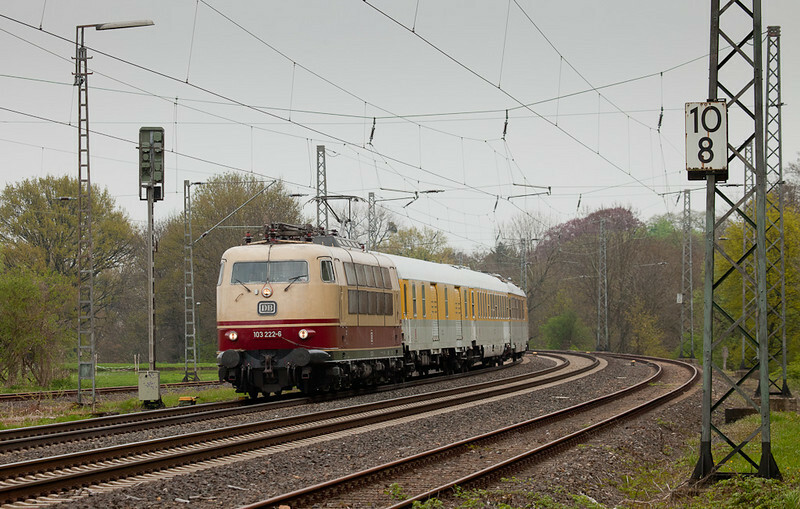 This is one of the nicer ones, a venerable 1970s-styled class 111 pushing her train of modern bilevel commuter cars towards the station stop at Übach-Palenberg north of Aachen. This line is rather passenger-heavy. There is a freight path available after each passenger move so for the diversionary routings one is well advised to stay put and expect something to follow within a few minutes. 111 115 pushes a northbound RE4 into Uebach-Palenberg. Nice weather, time to spend, good traffic, nice location - pick any three. Sound familiar? 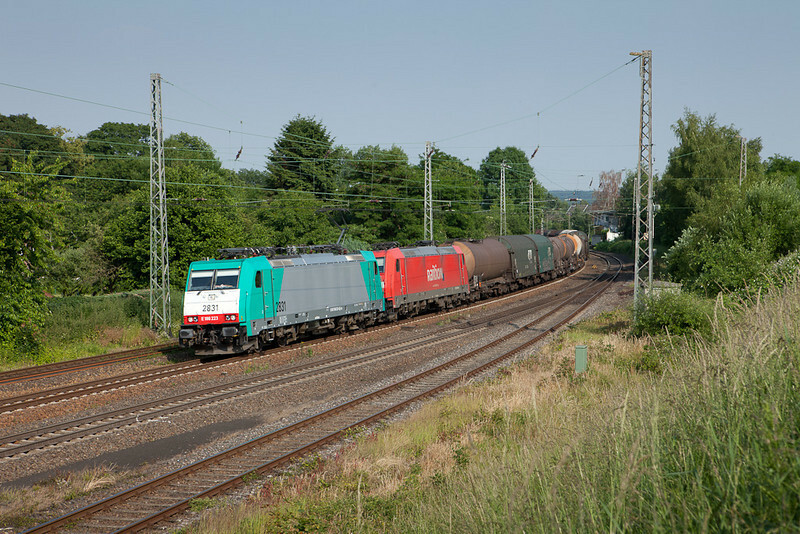 Today all four components came together as we're in the middle of a three-week curfew on the KBS480 between Aachen and Cologne, sending all freights to and from Belgium via the northern line (KBS485). This line usually carries only a trickle of freight traffic which is a bit of a shame as there are some quite scenic locations. Such as this one, on the southern end of Kohlscheid. A relatively unusual class 189 leads a very short and quite late empty limestone train southbound. 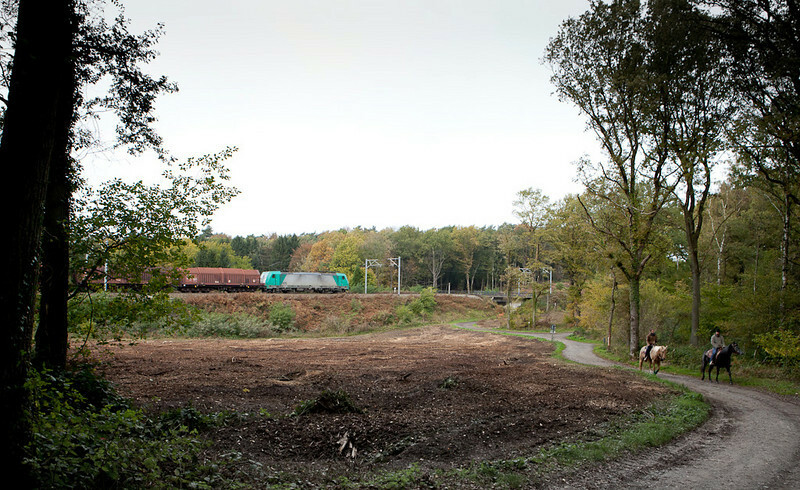 In a few kilometers a green Traxx will pick it up and forward it to the Maas Valley south of Liege/B for a new load. 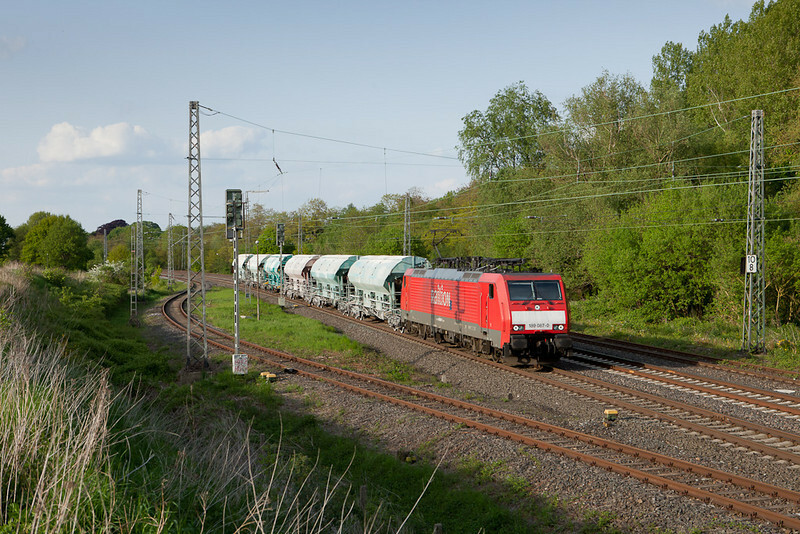 189 067 leads the limestone empties 48566 (Oberhausen - Hermalle s/Huy) through Kohlscheid. Back to Herbesthal again for yet another special move, this time a 14-car train with pilgrims returning from Lourdes/F. Fittingly enough the sun smiled from a Kodachrome sky. 2701 put on a fine show as it stormed underneath the road bridge that formed the Prussian-Belgian border - aptly named Rue Mitoyenne ("Neutral Street") to this day. The stately building on the right was the Prussian post office back in the day. The white building in the left background was the Prussian border station. The picture of 13-May-2010 was taken from its doorstep. Both structures unfortunately are left to decay. 2701 with pilgrim special from Lourdes/F in Herbesthal.